Back in the late 1990s I became a bit of a personal digital assistant (PDA) snob. I was enamored by the handheld gadgets that, all of a sudden, were able to do so much more than the simple electronic organizers of previous years. The early and mid-1990s saw the growth of these PDAs with the Sharp Wizard line that allowed the user to maintain a calendar and phone contact database along with some games, a memo pad for notes and a calculator. When the 3COM’s Palm Pilot came out, the PDA became a smaller, more powerful device. And I liked to get the latest one on the market. I went through each generation of Palm device and then experimented with the Handspring Visor. No matter which device I was using at any given time, a requirement was that it had the Luach app installed. Luach, created by Penticon Technologies, was the most robust Jewish calendar for PDAs on the market. With a Hebrew font interface, it made the PDA with Luach an essential technology for everyone from rabbis and Jewish educators to Jewish funeral directors and rank-and-file observant Jews. One of the most difficult aspects for so many when transitioning from a Palm or Handspring PDA or smartphone to one of a newer iPhone, Blackberry or Android device in the last decade was sacrificing the Penticon Luach. As an early adopter and supporter of Penticon and its Luach app twenty years ago, I became friendly with the developer, Howie Hirsch. Based in Israel, Hirsch would let me serve as a beta tester for future released versions of Luach and I would in turn give my advice – both from a technical perspective as well as from my vantage point as a rabbi. After making the switch to an Android device several years ago I began to pressure Hirsch to develop a compatible version for both Apple’s iOS as well as the Android platform. At first he told me how much work that would require and that he wasn’t sure he was up to the task. But then, we met over breakfast at my Jerusalem hotel in December 2012 and Hirsch shared the exciting news that he was ready to release a beta test of Luach for iOS. He told me about the significant new features he planned to add and I took the opportunity to express some of new features I would love to see. I had an Apple iTouch back in my hotel room so I was able to install the beta version while still in Israel and begin my work as a beta tester for the new Luach app. Finally, after years of hard work, Hirsch completed work on Luach and Penticon Technologies is back. He released the Luach version for Apple iOS late last month (just in time for the release of the new iPhone6) and gave me the opportunity to talk with him about the big news. Tell me about how Penticon began. Hirsch: I bought one of the early Palm Pilot devices, and knew that it would be a success. I started to hear on the internet that some people were figuring out how 3rd parties could develop software for the Palm, and I jumped on the bandwagon. I developed Hebrew for the Palm, and then Luach. Since I was living in Israel, I understood that many Israelis wouldn’t use a Palm without it having Hebrew. The Hebrew and Luach applications were big hits in Israel, and among Jewish Palm users outside of Israel. When did you come up with the idea of creating a Luach app for the Palm back in the late 1990s? Hirsch: I always had an interest in the Jewish calendar. When I started to learn how to develop applications for the Palm, I decided to do something that could be useful. I created a small application where I could enter a date, and it would give me the Jewish Date, and vice versa. As I learned more about developing for the Palm and learned more about the inner workings of the Jewish calendar, I realized that this would be an application that would be useful for me, and for many other people. This was in early 1998. Why do Jewish people need a mobile utility app like Luach? Hirsch: It’s so convenient to have the information that Luach provides available to you at any time. It’s particularly handy to have it together with your calendar, so that you can make sure to avoid conflicts with Jewish holidays when you are scheduling meetings or other events. It’s also very helpful to know the Shabbat and holiday candle lighting time when scheduling events in your calendar. Having Luach on your electronic organizer is exactly where you need it. Besides observant Jews, who else uses Luach? Hirsch: Many Jews who are not Orthodox still observe Shabbat and Jewish holidays in their own ways. These people want to know when the Jewish holidays occur. It’s still universal to celebrate yahrzeits (anniversary of a death), based on the Jewish date. Using Luach allows this to be done very easily. It’s also very useful to figure out the date for a bar mitzvah and determine the Torah portion that is read for that Shabbat. What are some highlights in the iOS version? Hirsch: This is something that is very individual. Different people find different features as highlights. For me, the most convenient thing is being able to see what time candle lighting is for the upcoming Shabbat. That’s right there on the home screen of Luach as soon as I open it. I also like the fact that I can view events from the regular iPhone calendar from within Luach, and I can create new events in the iPhone calendar from within Luach. This eliminates the need to switch back and forth between Luach and the Calendar when planning an event or meeting that needs to take into account the Jewish holidays or Shabbat time. Luach has the ability to be configured for the specific customs of each user. It’s also really easy to find out Candle Lighting times for any city, anywhere in the world. This is great for business trips, and vacations. Keeping track of yahrzeits is also very important. This is just the tip of the iceberg. There are many, many useful features, and which is most useful will vary greatly among users. What features are you most proud of and how will they be used? Hirsch: The original Palm version was very well liked. I used the foundations of the Palm application, but adapted it to the iPhone environment. This included taking advantage of the larger, high resolution screen to show more information on the home screen. In addition, I took advantage of the swiping ability on the iPhone to make it easy to get information for different dates and different cities. I took advantage of the iPhone’s GPS and Internet connectivity to allow you to get candle lighting times for your current location, or to automatically find the longitude and latitude for any city in the world. I took a great Palm application, and transformed it into an even better iPhone app. Will there be an Android version? Hirsch: That depends a lot on the success of the iOS version. A lot of time was spent developing the iOS version. I have had a lot of requests for an Android version, and I’d love to do one, but this is also my livelihood. Those who had Luach on their Palm organizers paid $25.00 for Luach, or more if they added Hebrew. On the iPhone, I’m charging $3.99 (and Apple takes 30% of that). This is a niche market, and I need a pretty significant volume of sales in order to recoup the development costs. If I see that I have a good sales volume, I’ll seriously consider an Android version. 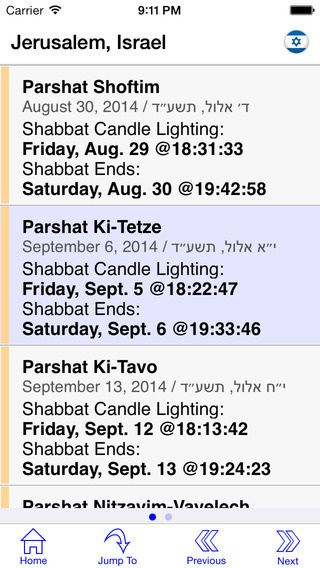 Can rabbis integrate every yahrzeit date for all of their congregants into the app? Hirsch: I’ve seen hundreds of yarhzeits/birthdays on an iPhone, and that doesn’t seem to be causing any problems. The newer iPhones are getting faster, so I don’t think that having thousands of yahrzeits would be a problem. What are some of the Halachik (Jewish legal) issues you faced in creating this app? Do you still hear from people using the Palm version on old Palm mobile devices (PDAs)? Hirsch: Believe it or not, I still get people emailing me that they just got a new Palm device and need to re-install Luach on it. Of course new means that it’s probably ten years old, and was purchased on eBay, or given to them by someone who doesn’t want it any more. I also get emails from people who say that they are still using their Palm because they didn’t want to give up Luach. How many downloads do you expect in the Apple AppStore? Hirsch: No app developer can ever really know with certainty how many downloads to expect. Luach for the Palm caught on by word-of-mouth back in the late 1990s. With the widespread use of the Internet and social networking, it’s easier to reach a lot of people today than it was 15 years ago. I am confident that anyone who uses Luach will love it and will recommend it to others. I had a lot of feedback from my Beta Test team during the development, and I’m very pleased with the results. During the first few days since its release, it’s been very well received. How do you plan to publicize the Luach app to Rabbis, Jewish educators, etc. around the World? Hirsch: I’m trying to use the Internet and Social Networking to get the word out. I’m hoping that customers who used and loved Luach on the Palm will hear about the iPhone version and if they have an iPhone that they’ll want it. If they don’t have an iPhone, then hopefully they’ll tell their family and friends who are using iPhones about. My customers for Luach on the Palm were very loyal and really loved it. I’m hoping that the same thing will happen with Luach on the iPhone, and hoping that it will go viral. Luach by Penticon, version 1.0 can be downloaded in the Apple App Store at https://itunes.apple.com/us/app/luach-by-penticon/id916521924?mt=8 Or visit http://www.penticon.com/luach for more information.